The Sodality of St Augustine was set up last year by the Latin Mass Society as a means for members to pray for each others' loved ones, who are lapsed or non-Catholics. 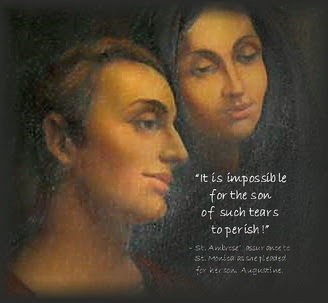 It takes its inspiration from the prayers of St Monica for her wayward son, St Augustine. In addition to a daily prayer, members can have Masses said for the Sodality's intention. Sunday 13th July, 10:45am, at St Bede's, Clapham Park. It will be a sung Mass with polyphony, the music provided by Charles Finch and his Cantores Missae. Members are invited to contribute to the cost of this Mass. For more details, to join and to donate, click here. The Sodality prayer is is the Collect of the Commemoration 'Pro Amicis' found in the 1962 Missal, which is ideally used in Masses for the Sodality's intention.